A lacquered square dish with indented corners, supported on four short feet. 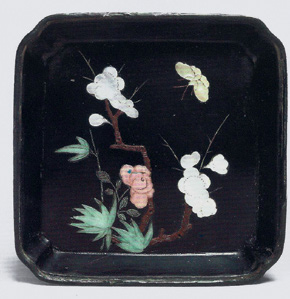 The flat surface is decorated with an insect, possibly a cricket, perched on top of a red blossoming peony flower, issuing from a jagged rock. Each part of the decoration is carefully inlaid with finely polished stones in various colours, such as red soapstone for the peonies, brownish soapstone for the body of the insect and leaves, yellowish-green jade and well-polished mother-of-pearl for the rocks. The background, the sides and the base are covered in black lacquer. The technique of inlaying precious materials in lacquer, known as bai bao qian (inlays of a hundred treasures) was invented in the Ming dynasty. It became known as Zhouzhi (made by Zhou) after its famous exponent Zhou Zhu, who was active during the Jiajing period (1522 – 1566). He used inlays of jade, coral, agate, tortoiseshell, and ivory in a lacquer surface to create complex, novel decorative effects. As the material is fragile and difficult to apply, extant examples are rare. A set of four Qing dynasty black lacquer dishes with inlaid soapstone and mother-of-pearl, closely comparable in size and design of flowers and insects (butterflies), is in the Muwen Tang collection (fig. 1). 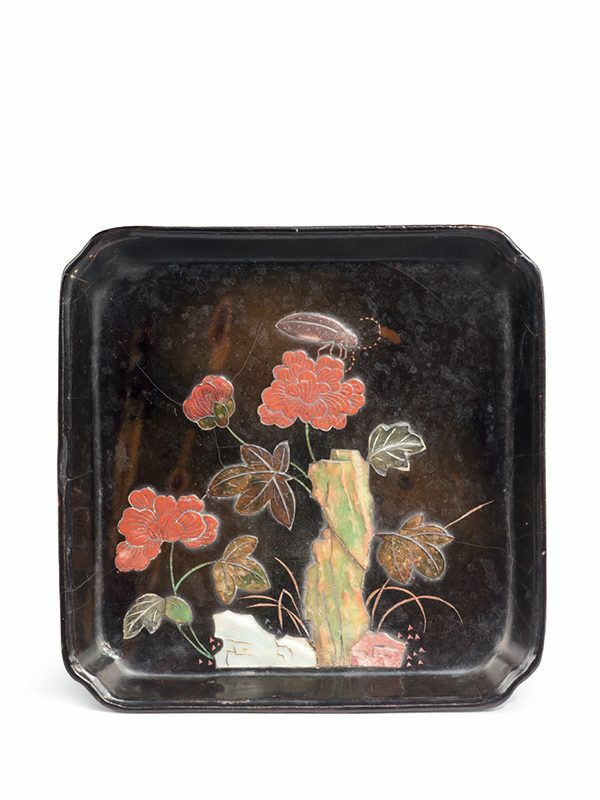 A further comparable lacquer square inlaid dish from the collection of Sir Harry and Lady Garner, similar in size and adorned with a pavilion in a landscape, is in the British Museum.